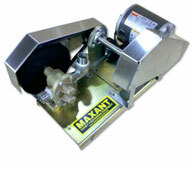 Maxant 1" Honey Gear Pump for moving honey from clarifier to buckets or bottling tank. Made in Ayer, MA, this sturdy pump has a 1/3 hp motor and 1" inlet and outlet connections. The food grade tubing and clamps to connect to the pump are NOT included.